One more image from the student work done at Valley Ridge. Leslie sent me this one; I know I missed a few others too. Isn't it wonderful? 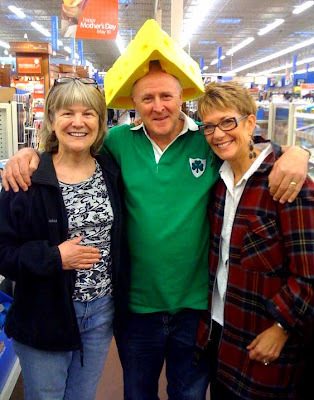 Kathy and I ran into this lovely visiting Australian at the local Walmart while we were searching for Amber Shellac for the class. A cheese head in Wisconsin!! Thank goodness Kathy could whip out her iPhone for this shot; somewhere in Sidney a village is missing its cheesehead. What a good sport. Of course I had that cheese hat on my head too before the visit ended. 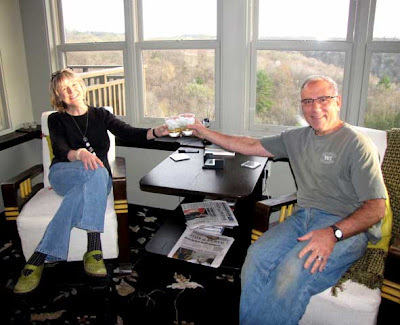 Here is that shot of Bill and I relaxing with our gimlets at the end of both days. I'm still glowing as I remember so many sweet moments with my wonderful students and hosts. And praise be, my allergies have nearly subsided now and the pain in my rib from so much coughing is nearly gone. I believe Valley Ridge restored me. I remember the days when there was a village in Texas missing its idiot. So happy those days are gone. And isn't memory a wonderful thing? I posted some memories today myself. i adore you...with and without cheese. Hi Judy, What fabulous work from your class, oh how I wish I could've been there. Recovering from knee surgery last week. 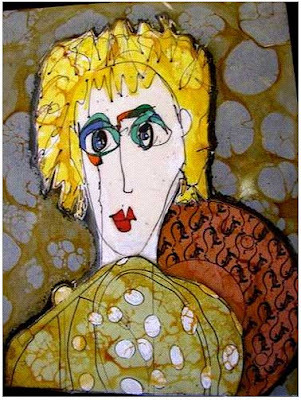 Looking at all that fantastic art is great therapy!! i can restore what valley ridge cannot. hop on your steed and skidaddle down here to the land of sunshine & birdsong. fabulous shoes! glad you had a great time--but then you always do, don't you? it's a talent, indeed! We were the lucky ones, Judy - the class was wonderful, and please know that your students are still smiling, as well. I'm so glad you got to see a cheese head hat! LOL! I look forward to seeing you again in Phoenix!